The Vikings were ferocious Scandinavian warriors that descended into Europe in the Medieval Age to search for plunder, trade, and land. Overpopulation drove them searching for better prospects elsewhere. Their attack in Lindisfarne in 793 signaled the start of the Viking Age, which was to last for about 400 years. Their exploits scattered across the continent and beyond, from the Black Sea up to Northern Atlantic and into the waters of North America. They inspired fear and uncertainty to the people with their overwhelming bravery, brutality, and greed. Series of Viking earl or chiefs and kings enriched themselves from the gold, silver, and slaves they took from Europe. But also, the Vikings also inspired admiration with their skills as explorers and colonizers as well as their open mindedness to other culture and religion. In this line arose Rollo, the founder of Normandy. Rollo was a mysterious Viking Earl or chief that probably came either from Denmark or Norway. Historians speculated Rollo was Hrolfr the Walker from some Viking Sagas, like the Orkneyinga Saga. The Orkneyinga Saga noted Rollo or Hrolfr rather as a son of a Norwegian Earl under King Harald Finehair. Further, the Saga described him as a huge man, so tall and heavy that no horse abled to carry him. Dudo St. Quentin, the writer of the History of the Normans, on the other hand pointed out Rollo was of Danish descent and he and his brother Gurim went to war with the king of Dacia (the old region of Denmark and Sweden) after their father’s demise. The war ravaged for 5 years until the King of Dacia deceived them with peace. The King offered amity to which both sides agree, but he mobilized his army secretly and attacked Rollo and Gurim’s city. A battle ensued and ended with a huge defeat for Rollo, especially after his brother fell. Rollo fled Dacia to Scandza (believed to be Scandinavia). Dudo stated that Rollo stayed long in Scandza until he dreamt of a voice urging him to go to England. He followed the voice and went to England. Upon his arrival he met resistance but he fought hard, won victories, and stood undefeated. Even though a successful commander, he remained confused of his next move: to return to Dacia, to go to Francia, or continue to fight in England. Eventually, Rollo continued to stayed in England and befriend a Christian King named Athelstan, who was said to be the Viking lord Guthrum, the warlord of the Great Heathen Army that fought Alfred the Great of Wessex. He then sailed to modern day Netherlands and wreaked havoc on the Lotharingians. In 867, Dudo commented Rollo sailed towards the Seine River, after he heard a voice in his dream urging him to sail to Francia where great rewards awaited him. He and his followers, mostly from Denmark and Danes from Britain, raided the fertile and rich coastlines of Northern France and the important Seine Valley, where Paris, the capital of Western Francia was. For years his raids devastated the landscape as well as the economy, taking the attention of Frankish King Charles III the Simple. West Francia was one of the three kingdoms that emerged from the division of the Holy Roman Empire. From the fruits of Charlemagne’s labor, it disintegrated into internal rivalry. A situation ripe for Viking’s to gain. Charlemagne expanded the lands of his Frankish kingdom to cover modern France, Central Europe, West Germany, and Northern Italy by the turn of the 9th century. His conquest resulted to the creation of the Holy Roman Empire, which brought political unity and stability since the fall of the Roman Empire in the 5th century. However, Frankish tradition of dividing lands to offspring, sibling rivalry, and ambitious and power magnates divided the Empire. By the 900, the Holy Roman Empire remained split into 3 kingdoms: West Francia, Middle Francia, and East Francia. West Francia in particular faced tremendous political infighting between members of the ruling Carolingian Dynasty and politicking of local magnates. By 898, Charles III the Simple ruled the Kingdom after his rival King Odo passed away. King Charles III’s was elusive. Not much was known about his reign. Certainly, the problem of Viking raids continued and post as a major challenge to his reign. With kingdoms divided from within and without, no one posed strong resistance against the terrifying and quick raids of the Vikings. Charles’ challenge was to find a way to pacify them as fast as possible. Dudo stated Rollo arrived near Rouen to the horrors of the populace. However, Rollo received word from the Bishop of Rouen named Franco that the people of the city were unarmed and wanted peace with them. The Viking leader choose peace and from that point Rouen served as his foothold in West Francia. Rollo then proceeded to raid the Seine Valley that menaced King Charles and his court. Rollo’s raid escalated around 910, when he made a daring raid on Paris. The outcome of the attacked determined his faith and that of Normandy. Decades before, Vikings attacked villages and communities along Europe’s major rivers. The River Seine and Paris itself suffered several Viking strikes, the most famous was in 845 by the legendary Ragnar Lodbrok. Rollo aimed to follow this success. Charles, on the other hand, tried to stop Rollo. He negotiated a 3 month truce, and on that period both sides would discuss Rollo’s conversion into Christianity in exchange for land grants. King Charles III saw land grants to the Vikings as a means to end many challenges he faced. Political turmoil remained a major problem. Maintenance of an army and rebuilding the kingdom resulted into dire financial situation. And Viking raids in fertile farm lands in the Seine land disrupted food production and the cost of defending villages in the region further burdened his kingdom. Danegeld or payment of gold and silver to the Vikings in exchange for truce was out of the question. Charles then looked for another bargaining chip to offer. Eventually, he offered Rollo one thing that Vikings also sought – land. However, the Frankish nobility outraged by the proposal ended the ceasefire and Rollo continued his raids and targeted the great religious and cultural city of Chartres. But Rollo’s strike on Chartres failed and he returned to Rouen. 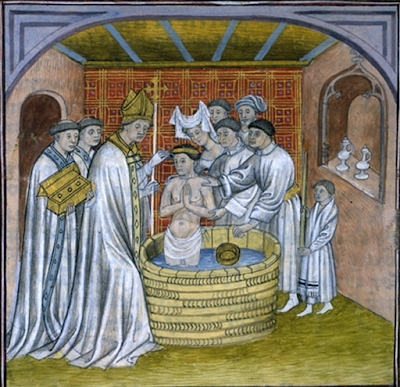 At that point, the Bishop of Rouen met with King Charles and served as a mediator for the prospects of an everlasting peace with Rollo. In 911, Rollo agreed to talk with a King for a settlement in a place called Saint Clair near the Epte River. Once again, Rollo was presented a land proposal from King Charles III. He saw it as a lucrative bargain as Vikings valued fertile land tremendously, especially when the harsh Scandinavian climate limited their farmlands and farming season back in their homes. Danish, themselves, proved themselves as enthusiastic settlers before in Britain during the conquest of the Great Heathen Army in the 9th century. The deal allowed them to settle and provide for their families with a new homeland without a war of conquest. However, a questioned remained that hampered the talks: Where would Rollo and his Viking party settle? King Charles III made several offers, like the region of Flanders, which Rollo rejected. Then, finally, both sides agreed with Rollo receiving the lands in the mouth of the Seine River and areas surrounding Rouen. In exchange, Rollo only needed to pledge his fealty to the Carolingian Kings and defend his lands against other Viking raids. As a sign of good faith from the Franks, he also received a princess to marry, Gisela, provided he converted to Christianity first. For Charles, the agreement removed tremendous problems for West Francia. It eliminated their responsibility to defend the northern coastlands and the Seine River. It freed many of their resources from fighting the Vikings to maintaining internal stability. Lastly, having Rollo helped them to have an insight on the culture, tactics, and politics of the Vikings. And so with both sides benefiting, they agreed and fulfilled the agreement. 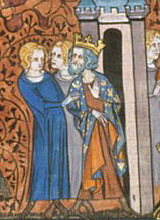 Rollo would receive his lands and serve as its lord. He would then convert into Christianity and received Charles the Simple’s daughter to wed. Finally, he only needed to pledge his loyalty to Charles by one controversial act – kissing the king’s foot. The humiliating act aimed to symbolically show the submission of a Lord to the King. Rollo, a proud Viking leader, refused and the deal went close to a waste. Both side eventually came with a compromise. They agreed to a proxy, a man from Rollo’s ranks, to perform the demeaning act. Stories narrated, during the ceremony, the chosen Viking acted in a way that lessened the embarrassment of the ceremony to his honor. Instead of kneeling and bowing to kiss the feet of the King, the warrior pulled up the feet, sliding down the monarch, bringing it to his face and kissed it. Although the act was submissive in nature, the warrior’s action brought laughter and somewhat embarrassment to King Charles as well. In 912, Rollo made true to his word to convert into Christianity and to marry Charles III’s daughter Gisela. The Bishop of Rouen Franco baptized Rollo who took the Christian name of Robert. He then married Princess Gisela, who many questioned whether truly existed or perhaps an illegitimate daughter of Charles III. If indeed illegitimate, Charles III then it can be suggest the Frankish King did not want one of her legitimate princess to marry a heathen. Rollo and his followers settled in the land what the Franks called as land of the Northmen, which evolved to become Normandy. Rollo continued to lead the Vikings in Normandy until his death in 930. His descendants expanded Normandy’s territory as West Francia once again descended into political chaos. Eventually, Normandy grew to become one of the most powerful duchies in France, becoming a virtual kingdom within a kingdom. Normandy grew into a powerhouse. The Vikings that occupied it in the beginning assimilated into the local populace and evolved into European Normans. Normandy expanded under Rollo’s offspring within the midst of political upheaval of Medieval France. Their expansion bought them prestige and prominence. In 1066, Duke William, a descendant of Rollo, took for himself the quest of taking the English crown, which he claimed to be rightfully his by agreement. On that year, he landed with his Norman army and fought the English army in the famous Battle of Hastings. 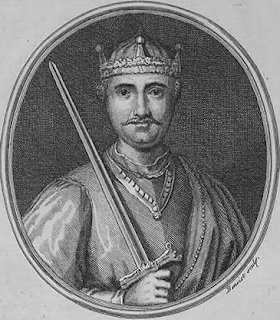 William won a decisive battle, where his archers shot and killed the English King. William won England by conquest and forever became known as William the Conqueror, Duke of Normandy and King of England. His rule of England influenced English culture with Norman and French ones. Following Duke William’s, Normans also expanded their reach to the Mediterranean. Norman lords and knight fought in Sicily as mercenaries but later on settled and established their own principalities. Eventually their might and power grew to the point that their descendants played major roles in the politics of the Italian Peninsula. Normans earned more land and power by fighting or supporting Popes. In 1130, the Norman lord Roger II unified Sicily and Southern Italy and established the Kingdom of Sicily. More Norman states followed with the dawn of the First Crusade during the last decade of the 11th century. Norman lords and knights fought the Muslims for the control of the Holy Land Jerusalem and the Levant. Norman Lords established themselves in the region, like the Principality of Antioch and the Principality of Galilee. The Normans of both France and Italy contributed to Crusades and earned land, riches, and prestige as well as the blessing of Popes. From Rollo’s acceptance of the deal with King Charles III in St. Claire led to the creation of a principality that exerted great influence and power. Their reach went as far as England and Italy, creating changes in politics and culture that paved away to developments in both countries. Glenn, Jason. “Charles III, the Simple (879-929).” In Medieval Germany: An Encyclopedia. New York, New York: Garland Publishing, Inc., 2001. “Normans.” In Encyclopedia European Peoples. By Carl Waldman and Catherine Mason. New York, New York: Facts On File, Inc., 2006. Dudo of St. Quentin. History of the Normans. Translated by Eric Christiansen. Woodbridge, Suffolk: Boydell Press, 1998.